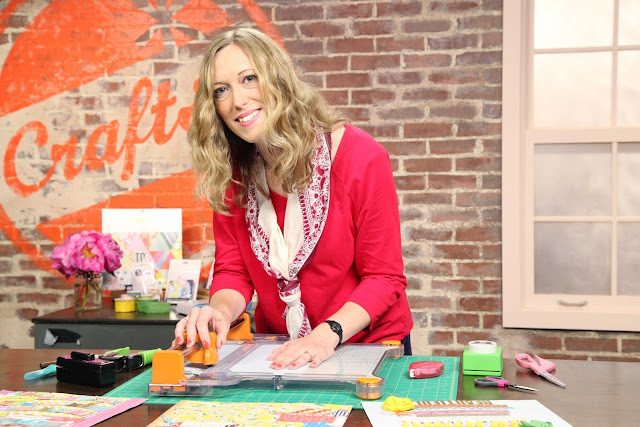 Welcome to a special blog hop hosted by instructors at Craftsy, an online classroom platform that includes classes on scrapbooking, card making, paper crafting and much more! Spend a little time getting to know each instructor on this list and the classes they teach through Craftsy. You'll discover that some of your favorite teachers are now offering classes through this incredible platform. Look for special giveaways from the instructors! Leave a comment on the participating blogs for your chance to win. Then join us on Craftsy for inspiring new ways to craft and learn! Hello paper craft and scrapbooking friends! So glad you could join our blog hop today, and I hope you have fun and take a minute to check out the amazing paper craft and scrapbooking classes offered through the Craftsy platform. 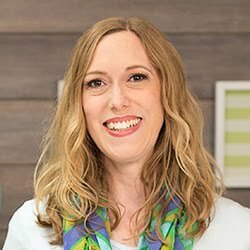 I'm Aly Dosdall and I've been designing, blogging, and teaching in the scrapbooking and paper craft industry now for over 17 years. My work has been featured in a variety of publications, as well as on the Home Shopping Network and QVC UK. Additionally, I share my paper crafts expertise as blog hostess and design team coordinator for We R Memory Keepers, and on my blog here, at alydosdall.com. 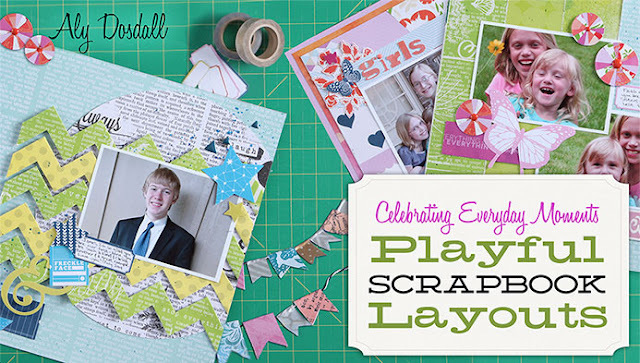 I have the pleasure of teaching Celebrating Everyday Moments: Playful Scrapbook Layouts. Throughout this class, you’ll learn a variety of fun techniques as you make seven playful scrapbook layouts — all with guidance from yours truly. Start by creating ombré backgrounds and effective color schemes. Then, find out how to bring depth to your page and alter your photos so that they complement your color scheme. Discover easy techniques for creating washi tape banners and learn essential design principles for strong, eye-catching pages. Next, make a fun chevron design and guide your viewer’s eye across your layout with sprayed ink! Moving on, mask your background, add a pleated and stitched border, and even create colorful starbursts. Finally, build a memorabilia file folder to store keepsakes on any page. Plus, you can purchase the class kit packed with Studio Calico patterned paper, die cuts, stickers, fabric tags and American Crafts washi tape on Craftsy. To celebrate this awesome blog hop, I'm giving away a FREE SEAT IN MY CLASS!! If you'd like to be considered for this giveaway, leave a comment below telling me if you've ever taken a Craftsy class and if so, which one. Comments will remain open until Thursday, July 16th at midnight EDT. I'll announce the winner on Friday, July 17th. Be sure to check back to see if you won! If you'd prefer not to wait for the giveaway, you can click on the link below to register for my class at a special blog hop offer of $10.00 off! Now you get to visit the other paper craft instructors' blogs and learn more about them and their awesome Craftsy classes. (Plus you get to enter more giveaways!) Finish your blog hop at the Craftsy Blog for more inspiration and prizes. Have fun! ETA: Comments for this post are now closed. Thanks so much for entering! I never took any Craftsy class, thank you for the chance to win! I have taken Danielle Flanders class. I was glad that I could stop after each class and return at my convenience. I would enjoy your class-Thanks for my chance to win it. I have taken a class or two from Aly on BPC in the past. I loved them, so I would love to win her class here. Thanks for the chance. I've never taken a Craftsy class. I would love to win a class and see what they're all about. Thanks! Your class looks great - I have taken Fun with Mixed Media, artful layouts and inventive ink. 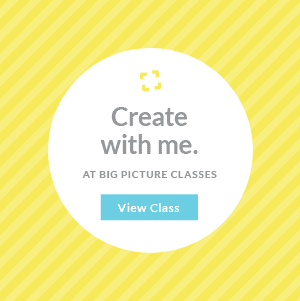 I've taken your classes over at BPC before - great classes! I have yet to take a Craftsy class, but I have taken a class of Aly's at BPC which I loved. Thanks for a chance to win a seat in this class. I have taken several but they have all been quilting ones, especially several from Camille Roskelley. Thanks for fantastic giveaway! I've never taken a Craftsy class - I'd love for yours to be the first! Thanks for the chance. I have never taken a Craftsy class. Would like the chance to take yours. Thank you. As a mother/grammy, it is so important to me to scrapbook my memories. I would love to learn more techniques. Looks like a great class. Thank you for the chance to win!! Thus looks so fun! Thanks for the chance! I have taken several card making classes but would love to do a scrapbook in one! Your class sounds fun. Thanks for the chance to win. I have taken Wilma's Fresh Techniques for Artful Layouts and thoroughly enjoyed learning new techniques to use. That small photo in your post with a glimpse of your style says this is the class for me. Thanks for the chance to win a spot in your class. Hi yes I have taken a Craftsy class, Cards with Dimension! I would love a chance to take your class! Your class looks great and your layouts are so much fun and so cheerful! Thank you for a chance to win! I've taken the Kelly purkey class "scrapbooking with style", And as a beginner to scrapbooking I'd like to take yours too. I actually took one of your classes on scrapbooking and a Kelly Purkey one also. Thanks for the opportunity to win. I have three sitting in my account, and I need to make time to watch and play. All are about card-making...but lately I have an itch to get back to a bigger canvas...and updating my scrapbooks. I've taken a class with you before (my very first one) but I'm not sure if it was through Craftsy. Thanks for the chance! Looks awesome. I'd love to join! I've signed up for a free card-making class but haven't taken it yet. I have not yet, but lately have been looking at the website. Sounds like a fabulous class and I would love to join in! I've taken Wilna's "Fresh Techniques for Artful Layouts" and Amy Tan's "Travel Scrapbooking". And I have 2 more to start so I can improve my stamping and sewing skills. I'm enjoying the Craftsy platform. I have taken one quilting class. I would love the opportunity to take your class. Your class looks great! Hope I win! I've taken several Craftsy Classes. Two of which were "How to Teach It" by Gwen Bortner and "Jewelry Workshop" by Max Goodman. I would really love to join your class and learn from you! I have taken one Craftsy class and it is Ms. Jen Gallacher's class....and boy do I love it! your class looks wonderful! would love a chance to take it! Yes, I have taken Wilna's Craftsy class. Also one or two of yours elsewhere! Love your style of paper crafting and teaching. I would love to win a spot in your class! No, i've never taken a class. I would love to! I love Craftsy and have several classes, which I can take over and over again. As a result, I have learned to make cheese, Asian and Italian foods, create wire and beaded jewelry, shoot photography, paint, and make fabulous paper products. Oh yes, I also learned to tat and even more. I would love to take your class -- thanks for giving us a chance to win! I love your blog. Thanks for the hopping fun, Aly! Ive loved this blog hop. I would love to take your class. I'm constantly inspired by others. This blog hop is a cool idea. Thank you for the chance to win your class. Haven't finished any yet but I've enrolled in several, including Hand-Embellishing Knit Fabric. I'd love to take your class. I've only taken a mini class and it was on cooking but I am looking forward to delving into other crafts. Most of the Craftsy classes I have taken have been knit and crochet, but I have recently enrolled in a couple of paper crafting classes as well. Would love to win one more! this is the class I want to win! All classes are interesting but Paige plays with paper in a fascinating way. OOps! I did not read the instructions. No, I have not yet. I'm not much of a scrap booker. I have some supplies but that is as far as it goes. I have taken the free Craftsy classes but that's all. Would love to learn how to scrapbook - thank you. I haven't taken a crafty class yet but have purchased one that I look forward to starting. I would love to learn how to scrapbook! Thank you for the chance to win a spot in your class! I recently signed up for a couple of Craftsy classes but haven't had a chance to start them quite yet. Yours looks like it would be a lot of fun, your scrapbook pages are gorgeous. Thank you for the giveaway! 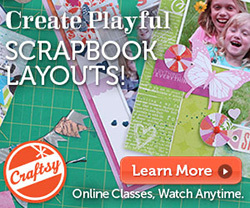 I have bought or gotten for free 235 classes from Craftsy. I keep hoping to find things to do lying down as I lay down 23+ hours a day. I am aiming at cardmaking, knitting, crocheting, drawing. I bought a lot of cooking classes for my Mom hoping to make life taking care of me more fun, She never feels confident in cooking, so I hope the classes make her just feel good about cooking. She does a good job with all her responsibility. I know I can't do scrapbooking on 12x12 but perhaps cards. Never taken a class on Craftsy. It tough to decide which one would fit my needs. I've taken several of the quilting classes but not the paper classes. That would be fun!